This tutorial was originally posted on my wordpress.com blog. 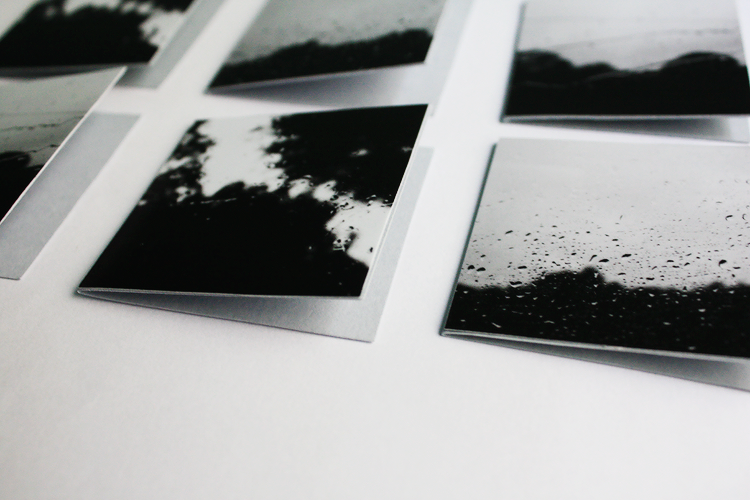 A while ago I was getting frustrated because I wanted to sell cards with my photographs on them in my Etsy shop, but I couldn’t afford a printer and none of the photo labs in town were up for printing cards for me. I could order cards online, but it had to be in batches, and the shipping costs were higher than the price of the cards. 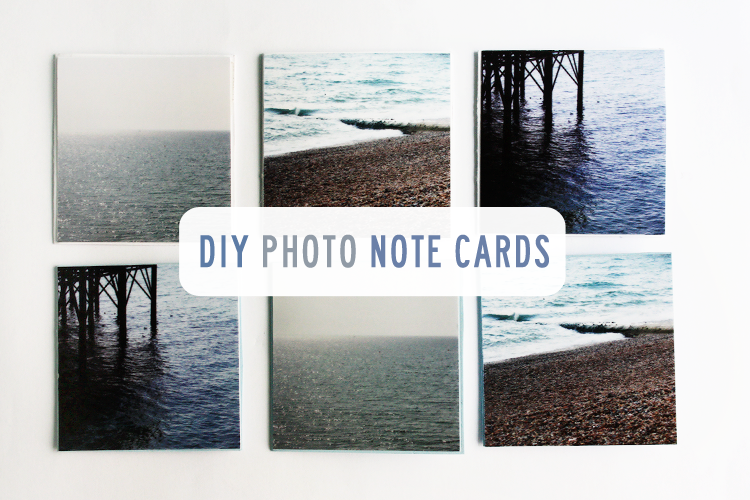 So one day I was talking about this in the FPOE (Female Photographers of Etsy) group, and someone told me she just made her own – with double-sided tape, the kind people use for scrapbooking. I’ve been making my cards that way since, and this post is me passing along that idea. The tutorial is just a formality. 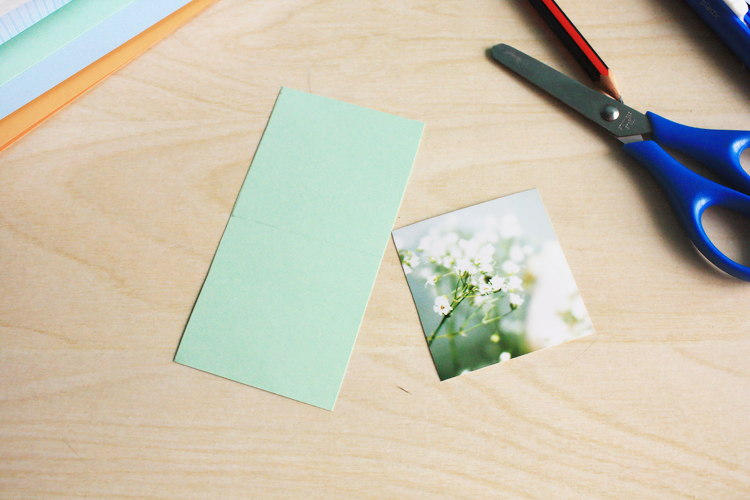 Keep in mind that you can use this tutorial to make cards of any size, but I’ll take you through my 2″ x 2″ (5 x 5 cm.) 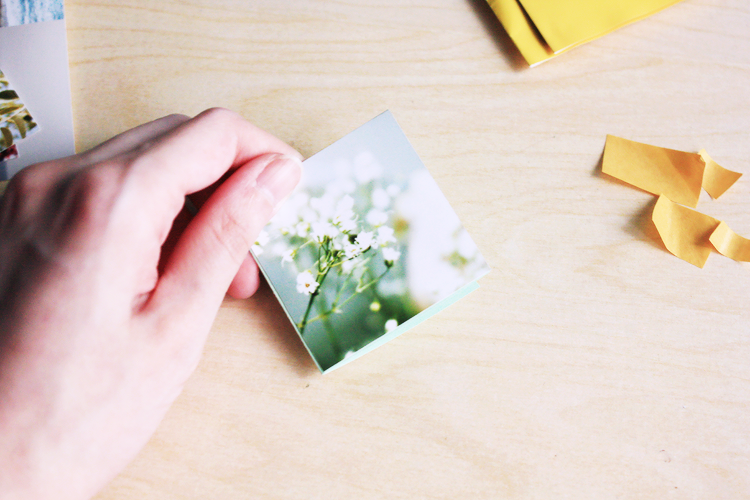 folded note card process because that’s the kind I make the most of. These are great to include a handwritten thank-you note with your orders if you have an online business – I include one in all of mine! 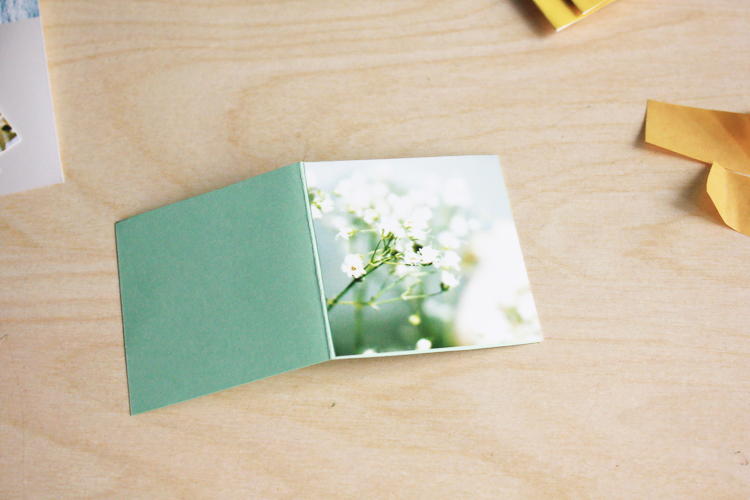 You can also use them as little notes for lunchboxes, or punch a hole in a corner and attach it to a gift. 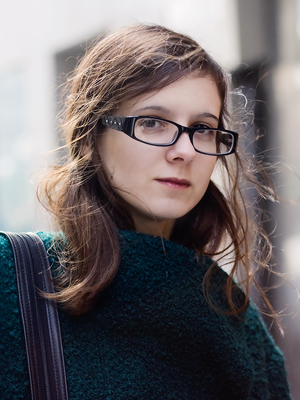 The best part is you can use any photo you have, including the kind you take for Instagram! If my sister took a lunchbox to school, I’d probably put notes in it with ridiculous pictures of our cat. It’s cute and useful, is what I’m saying. And very easy and inexpensive to make. The trickiest part of this whole thing may be getting your photograph printed. 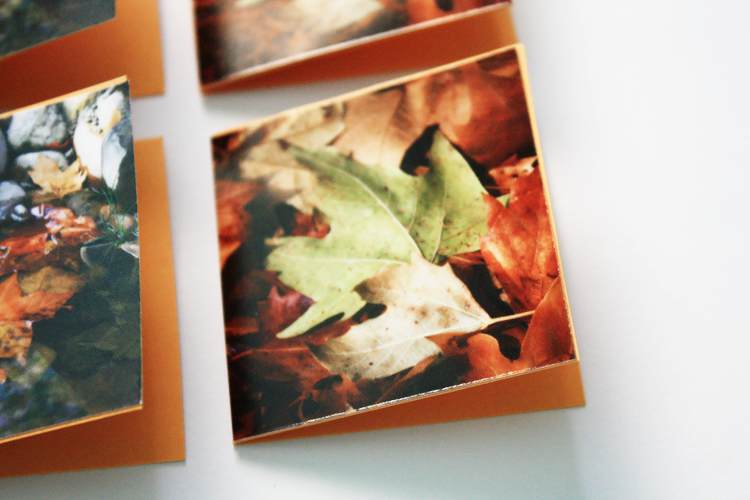 Most photo labs and printing services start at 4″ x 6″ (10 x 15 cm), so what I do is crop each photo to a square and make a collage with six of them. Then I take those files to the photo lab. It’s very easy to make a collage like this in any editing software, and you don’t have to use huge squares – since you’re printing very small, most places will give you really good quality prints if each square is 750×750 pixels (the file itself being 2250×1500 px). Any smaller than that and you may run into trouble. Speaking from experience here. The one unavoidable “issue” I’ve encountered with this is that more often than not, your squares won’t all come out the same size. The cutter (whether it’s a machine or a person) will always take a little bit more of one edge than the other. This is normal and I don’t see it as a problem, but if you want all your squares to be 2″ x 2″ exactly – well, you’re better off printing them yourself. 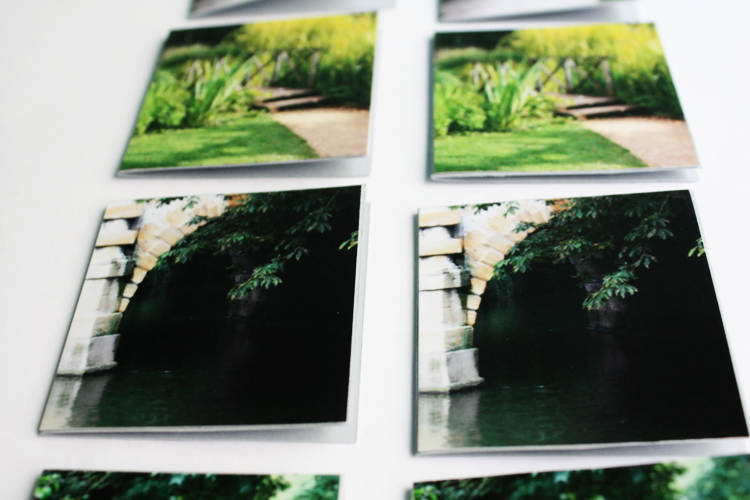 But you could also add a border to your file and have it printed in 5″ x 7″ size. Those are usually just a few cents more expensive than 4″ x 6″s. Like I said, though, I don’t see anything wrong with my note cards not being all the exact same size, so I print all my collages in 4″ x 6″. Once you have your prints, we can start our tutorial. 1. 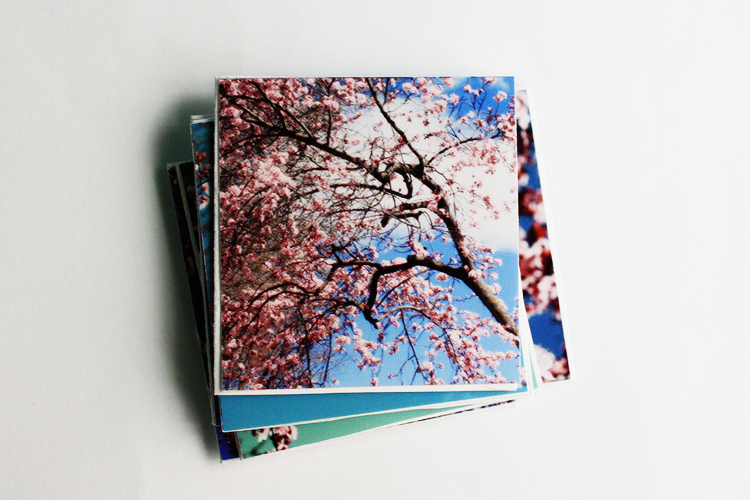 Cut your 2″ x 2″ square out of your 4″ x 6″ print. 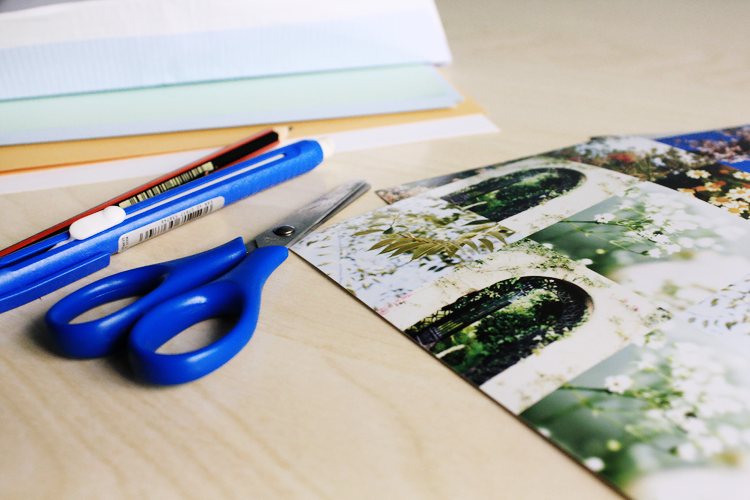 You can use scissors or, if you have a photo cutter, you can use that. 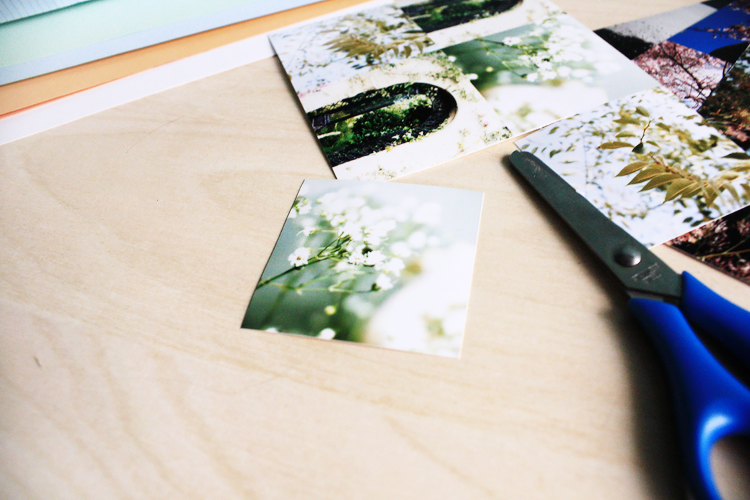 You can also position an aluminum ruler along the edge you’ll be cutting and use a regular cutter. Whatever works for you. 2. 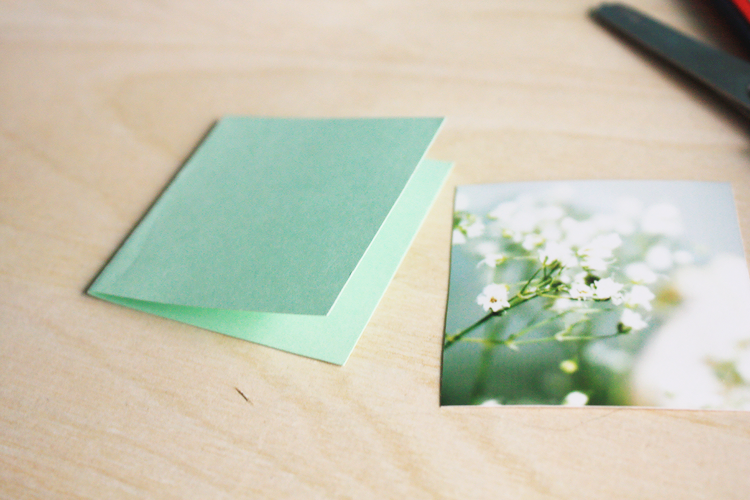 Once you have your 2″ x 2″ print, put it on top of your cardstock and use it to mark the notecard you’ll be cutting. I just draw a square around it, then position the print along the side edge of the penciled square and draw another square around it. If your prints are all exactly 2″ x 2″ you can just use a ruler and measure a 2″ x 4″ rectangle, but mine are not, so I do it print by print. 4. Fold it! If there are any visible pencil marks, erase them now. 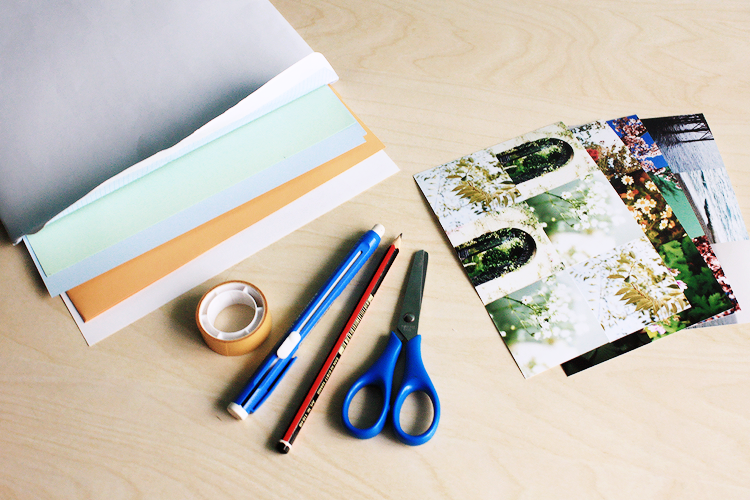 Or fold the cardstock so that they fall conveniently where you’ll tape your print. Whichever. 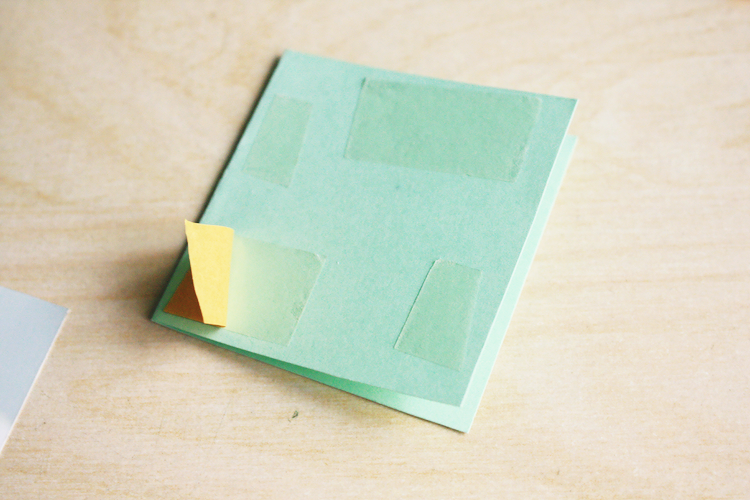 If you have tons of double-sided tape, feel free to cut three long pieces and cover the entire front of the cardstock. 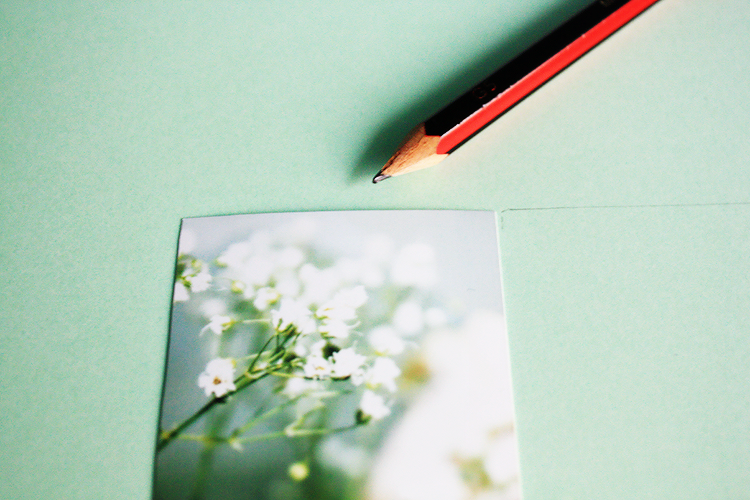 My double-sided tape is ridiculously strong, so I haven’t had any issues covering just the corners of the card. 6. Peel off the back of the tape. Be careful. I don’t know about other tapes, but the kind I use attaches to hairs (and fur) like it’s its dream job. If you have a kid (or an annoying little sister), this is a great job to let them do. Keeps them entertained and there’s very little chance they’ll ruin it. I often make a whole set up till here and then holler for my sister to peel the back off the tape while I make another set. Yep, you’re done. Unless you want to make more of them, in which case, hey, don’t let me stop you. I sell sets of these on Etsy, so I pretty much have a box full of them at any given moment. For me, there is a step #8, which is basically cut and paste a sticker with my shop name and URL to the back of the card. (If I had a stamp, I’d stamp them, but I can’t afford that just yet.) There is only so much room inside! Just order a larger print! Hope you found that useful. If you have any questions, don’t hesitate to ask! I think my favorite thing about is how mechanical it is. Sometimes you just need to shut off your brain and work only with your hands. Love this idea!! I should do this for birthday cards! 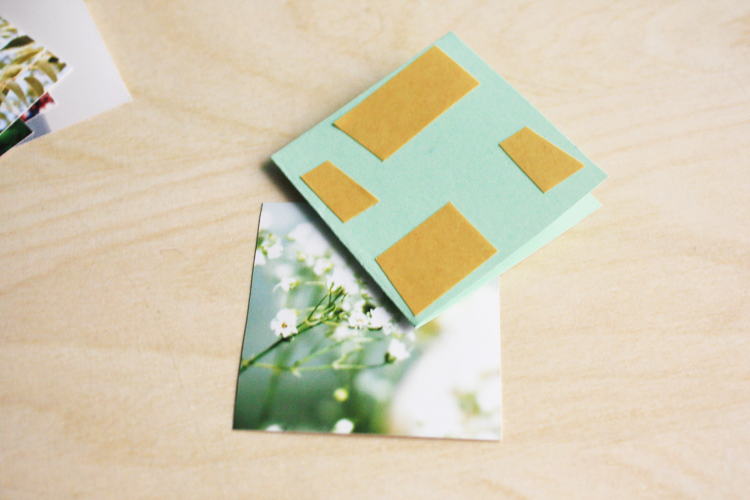 I have a whole roll of double-sided tape sitting in my drawer – thanks for the inspiration! Just need to get snapping with my camera now! Thank you! And thanks for sharing the link on twitter!